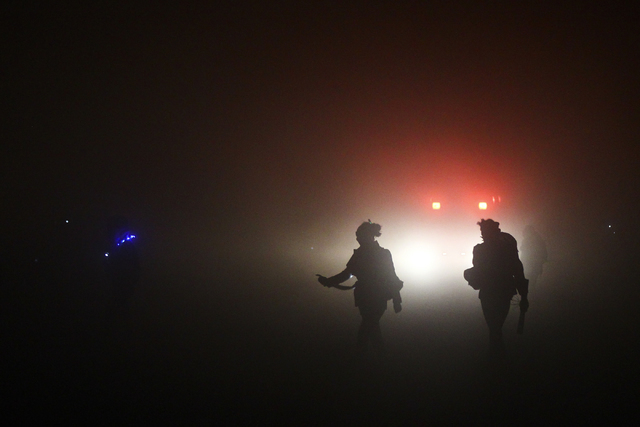 After a calm, clear day, the night’s wind and thick dust turned Black Rock City into an otherworldly post-apocalyptic scenescape in Northern Nevada. 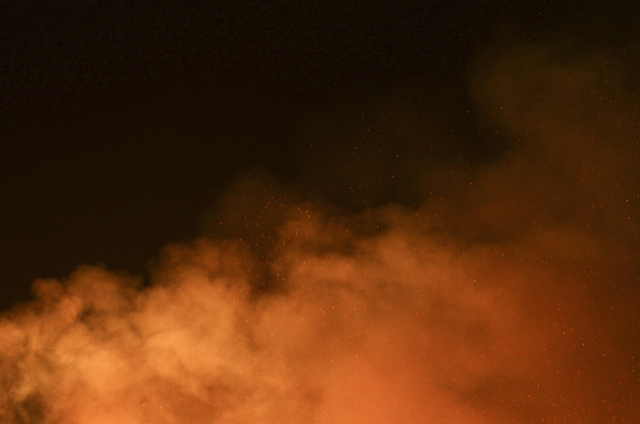 BLACK ROCK DESERT — After a calm, clear day, the night’s wind and thick dust turned Black Rock City into an otherworldly post-apocalyptic scenescape. 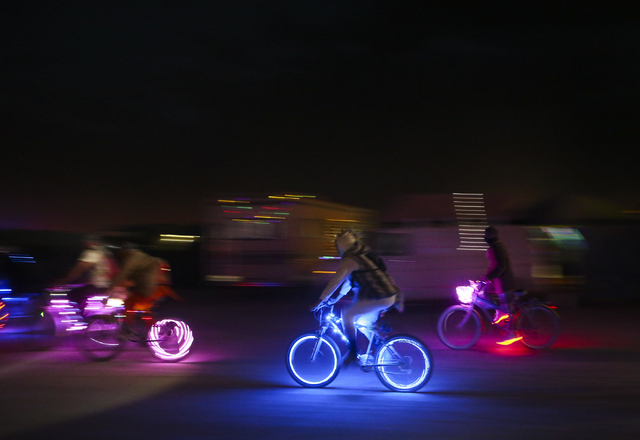 Only the colorful, glowing wires people wore wrapped around backpacks and coats were visible, along with beams of lights streaming from their headlamps. Bikes lay in heaps, covered in a powdery gray veil of dust. 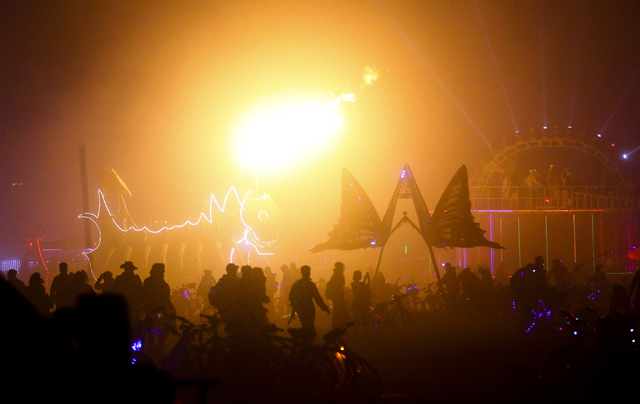 Through the haze, the neon-lit forms moved in one general direction: toward the Man. 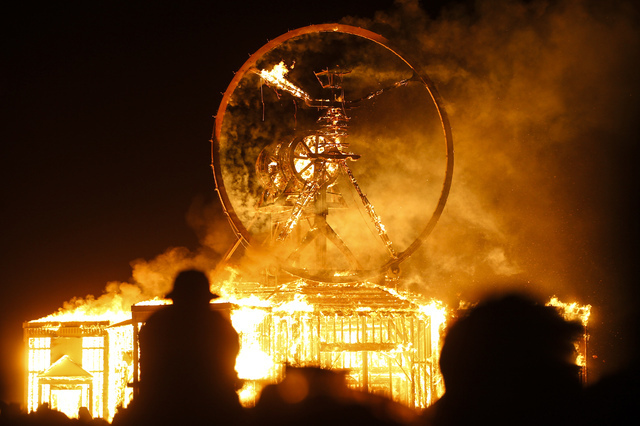 Obscured by the gusting dust, the 43-foot tall effigy resembling Leonardo DaVinci’s Vitruvian Man stood in the distance, waiting to burn Saturday night in the culmination of the annual Burning Man festival, an eight-day counterculture gathering in Northern Nevada that honors radical self-expression, self-reliance and inclusion. 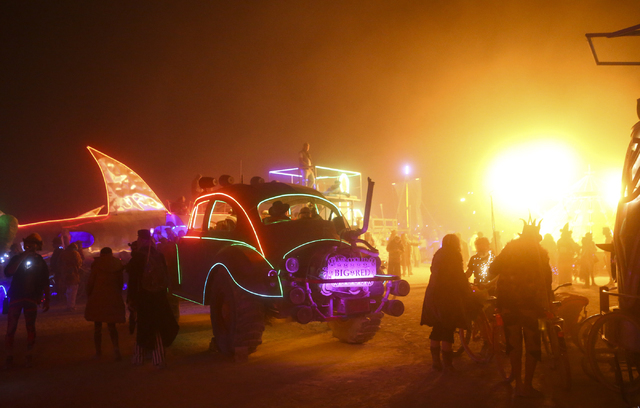 To get to burn site, festivalgoers first crossed through a ring of art cars, some nearly two stories tall and pumping out thunderous bass lines of electronic dance music. 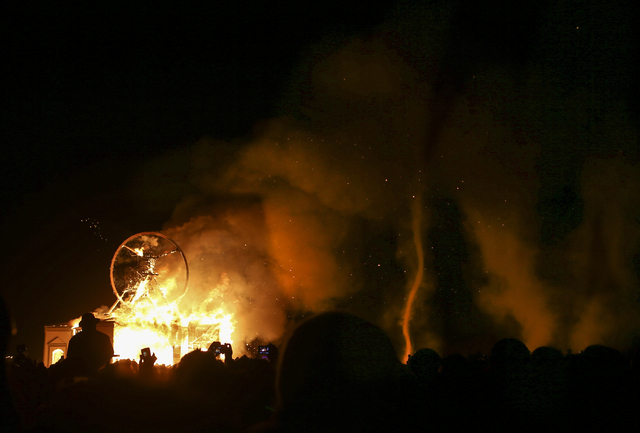 The Man, outlined in glowing red light, gradually became more visible as the winds settled down. 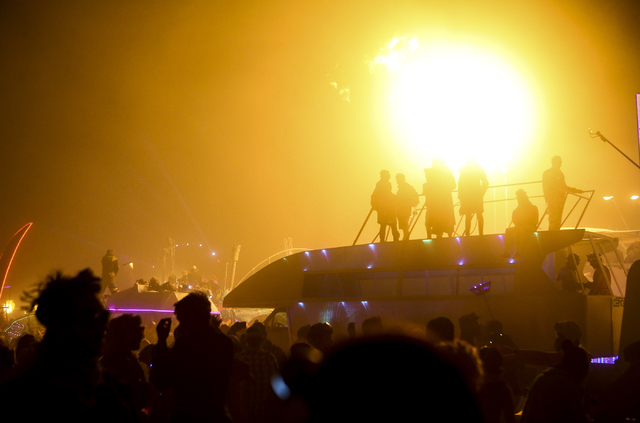 Between the art cars and the safety perimeter surrounding the Man, Burners sat calmly at first, becoming gradually more restless as they waited for the festival’s main event to begin. 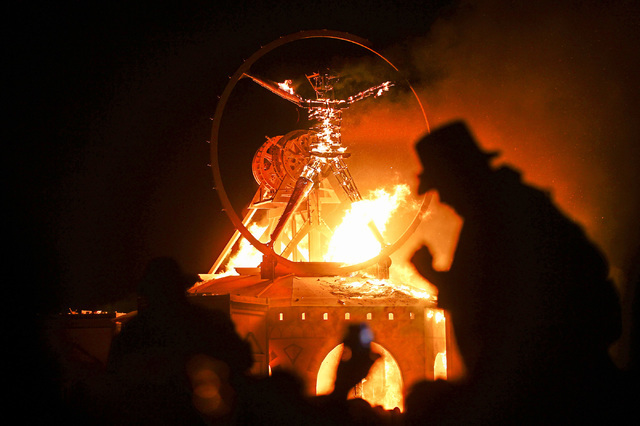 “For me, it’s a symbol of letting go,” said Francia Rabago, a 33-year-old second-time Burner from Los Angeles. 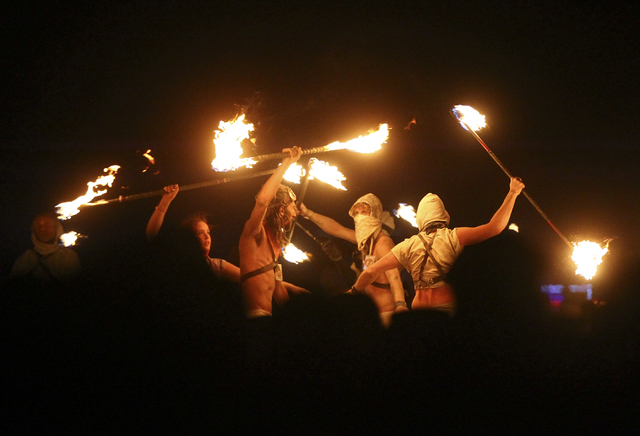 As pyro technicians readied the Man to burn, fire dancers twirled illuminated staffs and hoops. 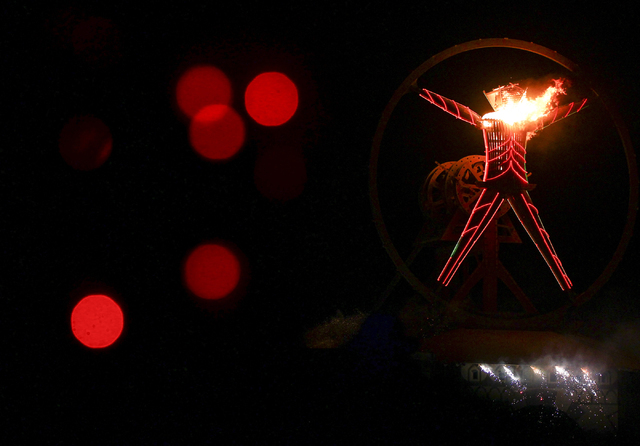 Finally, white sparklers shot from the ring surrounding the Vitruvian Man. 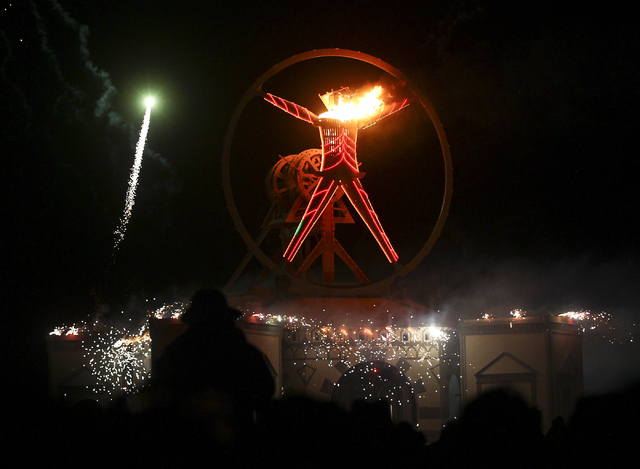 As the cheers subsided, the crowd sat in quiet awe as fireworks lit up the sky around the Man. 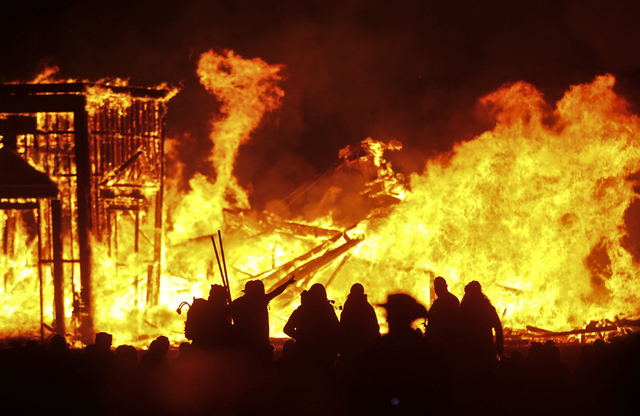 Flames engulfed the wooden frame; first the head, then the body. 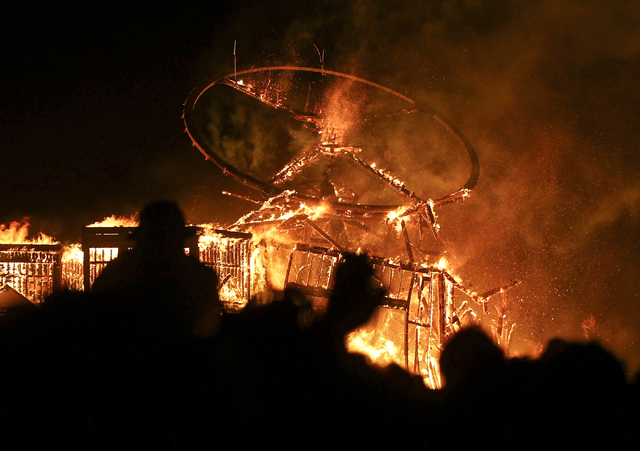 About 45 minutes later, the entire structure collapsed backward as the crowd roared cathartically. 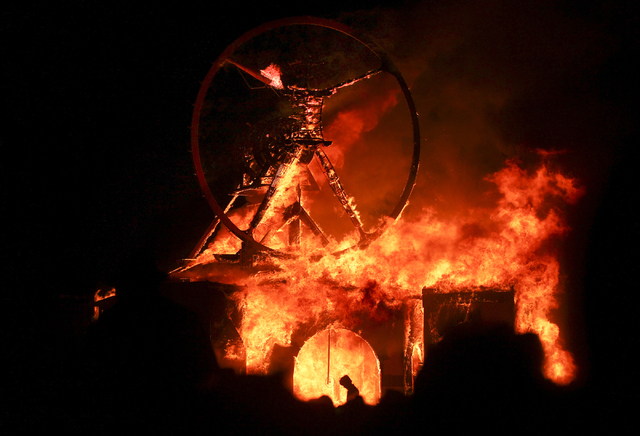 What began as an 8-foot tall figure surrounded by 35 revelers on Baker Beach in San Francisco in 1986 has grown exponentially. 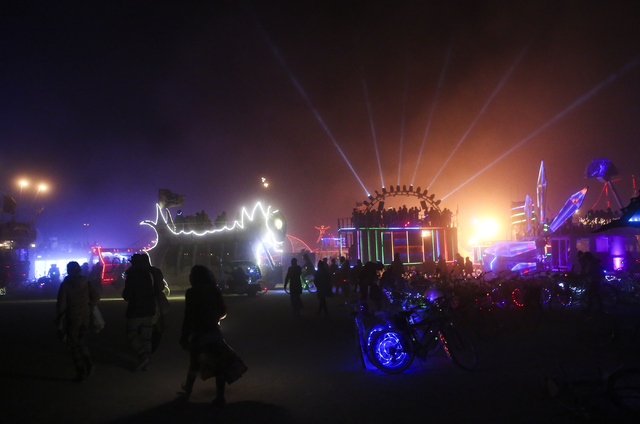 Attendance has increased from 350 attendees the festival’s first year at the Black Rock Desert in 1990 to nearly 70,000 people from 2013 onward. 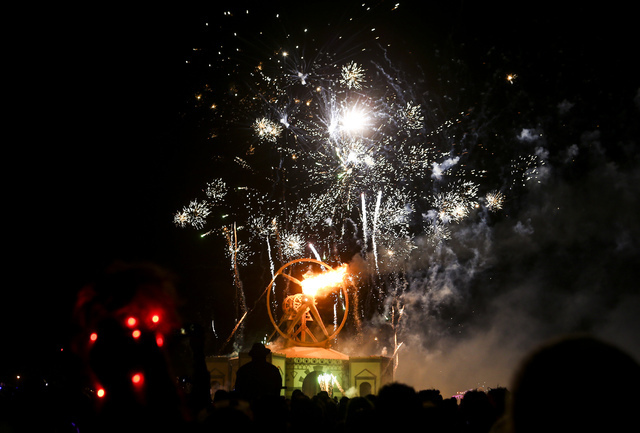 As of Saturday morning, about 65,000 people had entered the gates of this year’s festival. 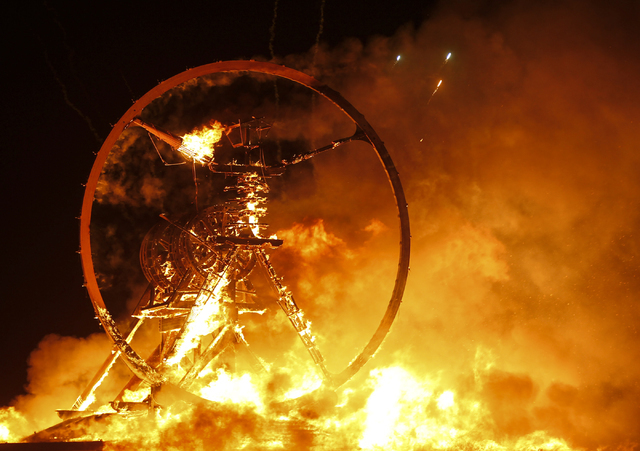 The same primal, instinctual lure that drew cavemen around a fire is still at the heart of what draws people from all over the world to watch the Man burn, said Dave X, Burning Man’s fire art safety team manager. 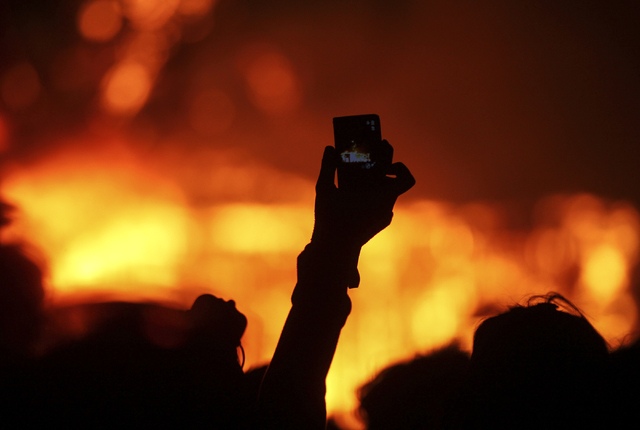 Thousands of years ago, standing around a simple fire, people could share information, stories and meals. 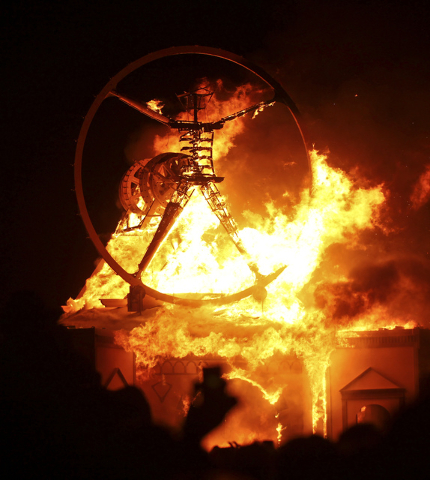 For Elizabeth Gracida, a 21-year-old from San Diego who watched the Man burn for the first time Saturday night, the event was just that: a moment in which every one came together to appreciate all that had occurred over the previous week. Read more from Sarah Corsa at reviewjournal.com. Contact her at scorsa@reviewjournal.com and follow @sarahcorsa on Twitter.